Referee: M. Dean | Attended :‬ ? Manchester United (1) : Chicharito[16']. Swansea City (2) : Wayne Routledge[12'], Wilfried Bony[90']. Lindegaard; Smalling, Evans, Ferdinand, Büttner; Valencia, Fletcher, Cleverley, Kagawa; Welbeck, Chicharito. Substitutes : De Gea, Fabio, Anderson, Carrick, Giggs, Zaha, Januzaj. Tremmel, Tiendalli, Amat, Chico Flores, Taylor, Britton (capt), de Guzman, Shelvey, Pozuelo, Routledge, Bony. Substitutes : Cornell, Davies, Williams, Rangel, Canas, Donnelly, Vazquez. Assistant referees : ? and ?. 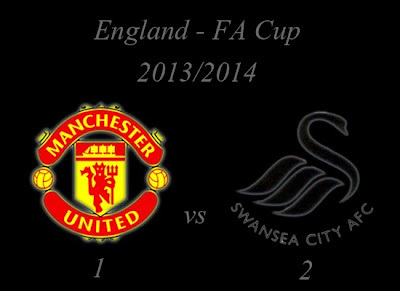 How do you think about FA Cup : Manchester United vs Swansea City?